There are really two possible types of damage (we cover this on our website in the shipping policy halfway down start in bold and red, but this really breaks it down with this post). Also at the bottom of the home page under “Damage Policy”. The freight company drops the crate of the back of the truck right in front of you. If you are the 0.1% of people this happens to (and yes, it has happened) then you refuse the shipment. We re-ship you a new order. In most cases extreme damage happens at the receiving terminal, for example we are in GA and lets say you are in Dallas, TX. When your order gets to the UPS terminal in Dallas they drop your shipment and it smashes the crate, UPS will call us to explain what has happened. They say the shipment was dropped. You will not even get to see it. Accidents do happen. In this scenario we simply re-ship another order. We re-ship as soon as we hear it has been damaged. We will deal with the shipping company. We will contact you, explain what has happened and send a new shipment. This is not a common occurrence, less than 0.1% of all shipments. Just a bit of chipping, broken or some damaged tiles in transit. Please note that up to 5% of your order/tile damaged, chipped, broken or scratched, polished instead of honed, honed instead of polished (please do not make us write every possible scenario and be reasonable) is acceptable. Not everything will be absolutely perfect (there I said it – we will do our best but we are not perfect). Chipped tiles are not a complete loss they can cut and installed where cut pieces are needed. Our quality of stone is very high, prices very low. To compensate we do cut and produce the stone tiles faster than most companies. Therefore there can be some imperfections, scratches, chips and even a few mixed up pieces. We estimate that risk to be acceptable up to 5%. If you do not agree and need perfect tiles, then please buy from a local retailer where you can pick up the tiles and examine each one for yourself before you take the order home (which cannot be practical on a large order anyway). This is 5% of the entire order. If you order multiple products totaling 1,000SF and 4 tiles are damaged then that is 0.4% this is completely acceptable. Tiles can be broken during transit. A broken tile can still be used. Tiles will need to be cut during installation to finish the ends, use the broken tiles or trim pieces for this purpose. Mosaics can get some damage in shipping. We ship mosaics UPS or FedEx. While this is not the safest way to ship it is the most affordable and we have yet to have damage greater than 3.5%. Mosaics can be removed from the mesh. They are designed that way. For example there 42 pieces of 2″ Hexagon on a sheet. If 4 tiles are damaged on a 10 sheet order this represents less than 1%. 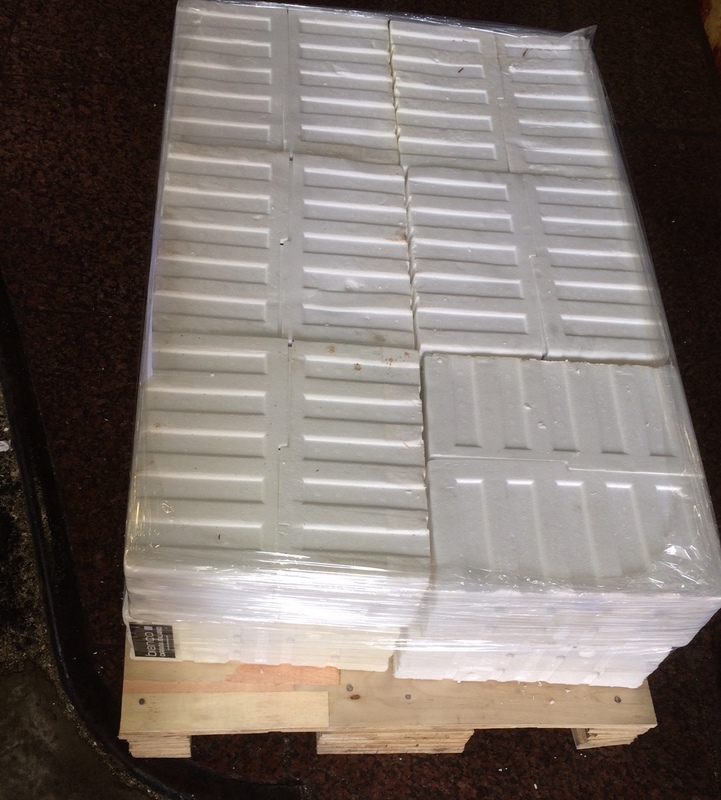 We are not going to ship you 4 new sheets for 4 damaged mosaic pieces (in the same way if you have an accident and dent a car door you do not have to buy them a new car, you replace the door – if anyone has a better analogy please let us know). In fact for this example the damage is less than 1% so we are not going to do anything. We are not going to do anything unless the damage is over 5%. (Example A: 20 Sheets of 5×5″ Hexagon. 5 tiles to a sheet equals 100 tiles, if 4 tiles are damaged/broken we are not going to be able to help as this is 4%. Example B: Same as before 20 sheets shipped except 7 tiles are now damaged. In this case we spring into action and ship out three 5×5″ hexagon tiles). Please be reasonable with claims and help us keep our costs low for everyone. Damage occurs in shipping and during manufacturing. It is not extreme it is generally under 5% more than 5% then we are here to help. If you do not agree with this, which we understand (our business model of premium products and low prices does not fit with everyone) and require perfect tiles with no damage please do not purchase from our website. I have more than 5% Damage. What now? This will only likely to have happened on a UPS ground order. Why? Because they throw the boxes and unfortunately see “fragile handle with care as a suggestion. But how else can we get 20 Square Feet of marble to you? I am sure you do not want to pay $175.00 for it to ship freight on a pallet, instead we take the risk of UPS ground – that risk includes some risk of damage which we outline and say could be up to 5% in our shipping policy. Not all UPS shipments are damaged, perhaps less than 2% but they do get some damage. Take pictures and send them to us. We will replace what the damaged tiles that are over 5%. UPS will own the others and most likely send a label to collect so we can file a claim. 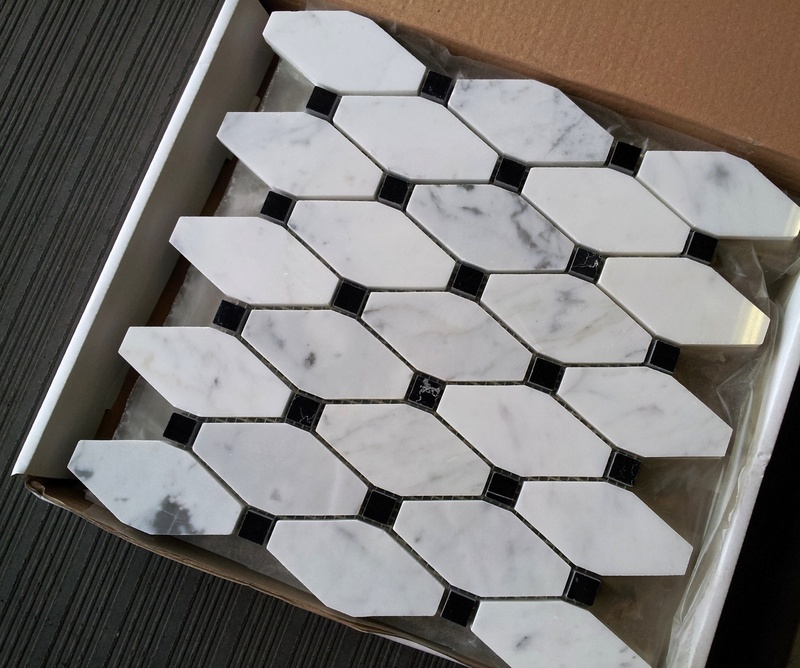 Please remember we only ship mosaics ground otherwise the damage rate would be a lot higher, that is why the subway tiles have a minimum order of 85SF+. Let’s cover an example one more time. For this example we have shipped you 2×4″ and it was 40SF. 8 of the 2×4″ tiles are damaged. 40SF is 40 sheets, that is 720 two by four pieces (so 720pcs of the 2×4″). Of these 720 pieces 8 are damaged. So 8 divided by 720 equals 1.11%. So this is way less than 5%. 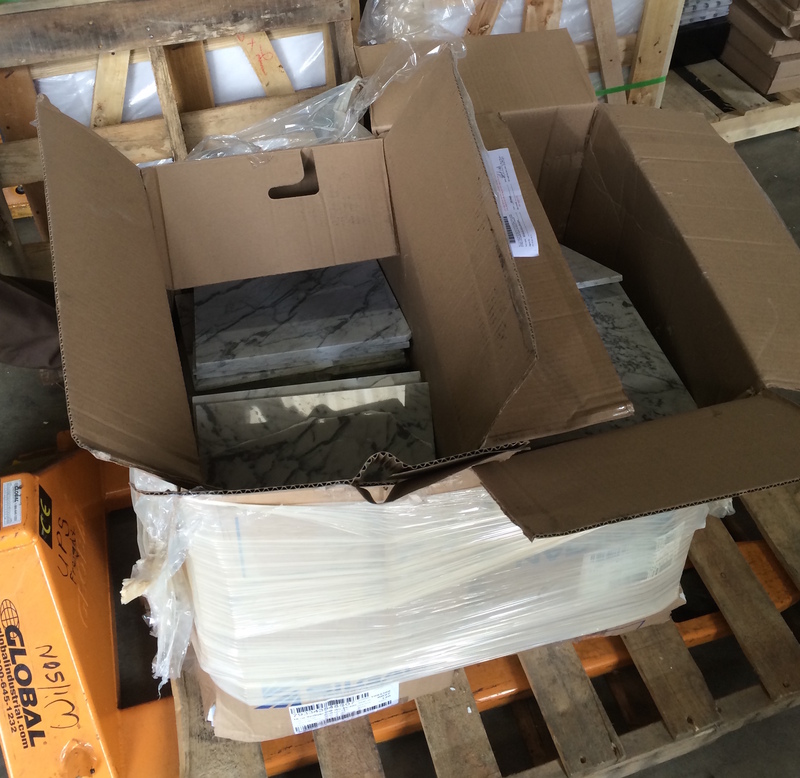 We will not ship you any additional tiles if it is under the 5%. Over ordering by 15-20% really helps, this will give you extra tiles, you can use these to replace the damaged tiles. The chipped or broken tiles can be cut and installed. A tile chipped at the end can be used as an end piece. I know you unhappy the boxes were probably damaged, the tiles may have had a few chipped. It is not great. But in this example it is well under 5% and we make this clear as part of the acceptance for using the website. Although we make every effort to avoid damage it can occur. We do have a damage policy located on our home page and on our shipping policy in bold. We think it is reasonable, as most chipped or damaged tiles can be used as cut or end pieces. Additionally when you order you do so by over ordering by 10-15% this over ordering usually helps with the damage. FINALY DO NOT DISCARD any of the damaged material or packaging. Once reported, the damaged material is the property of the carrier, by law, and they have 120 days to decide if they wish to inspect, pick up or advise to discard the damaged material. Container arrived and everything is perfect. Italy is again producing some incredible products. (This being my favorite design). The Long Octagon is perfectly cut, white base with gray veining. We know you want this marble to disappear and we know you want money back in your account. But for whatever reason this is coming back, we need to be smart in how it is done. 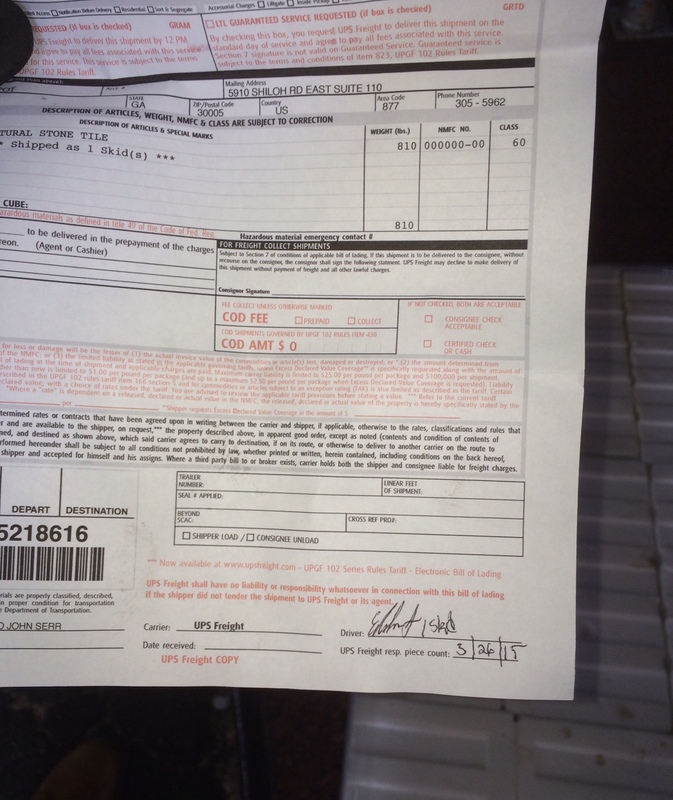 We will email you a BOL (Bill of Lading – a shipment cannot go anywhere without one). You will want to make 2 Copies, one for you to sign and give to the driver and one for the driver to sign. The truck will not come until you call them and say, “my shipment is ready to be collected”. The 800 number is on the BOL. The shipment will be picked up in the same way it was dropped off, so a driver with a truck with a lift-gate and pallet truck. The shipment will need to be in the same place making pick up easy (it cannot for example be stuck at the end of a 100FT gravel driveway). I know this is an effort but you want the pallet truck to be able to easily collect this crate/pallet. Do not start packing the pallet/crate until it is in a spot that a fork truck can easily get to. A smooth flat surface. The shipment will need to be carefully packed and secure. If it is not in a crate then you will need to shrink wrap it, tightly and securely, shrink wrapping the product to the pallet so it cannot slide off the pallet. Take pictures of the shipment before it ships, if you can take one of it being loaded onto the truck. Pictures are VERY important. If UPS drops this shipment later during the journey and we get in a box of destroyed tiles that are half the size of what you shipped, then we can compare pictures and making a claim against UPS is very easily. Also it will ensure the driver is just that little more careful with it, as he knows you have pictures of the condition it left in. Pictures really are the key. When the driver signs for the shipment he is signing that the product is being collected in good order and well packed. You want that piece of paper. Please send us pictures as soon as it is picked up. Then when it arrives our end, we can compare the images. What the customer shipped (it could have been packed better, the product is not secured to the pallet). But if the driver was not happy he should have asked for it to be done better and not signed for it. What we got back – a complete mess. UPS dropped the shipment threw the tiles in a box and broke them all. For the customer UPS’s error was their win, as they did not have to pay a restocking fee and no shipping cost. We just refunded them and we filed the claim with UPS. But this was only possible because the pictures are so clear. Words so difficult to explain it is true a picture really is worth a thousand words. 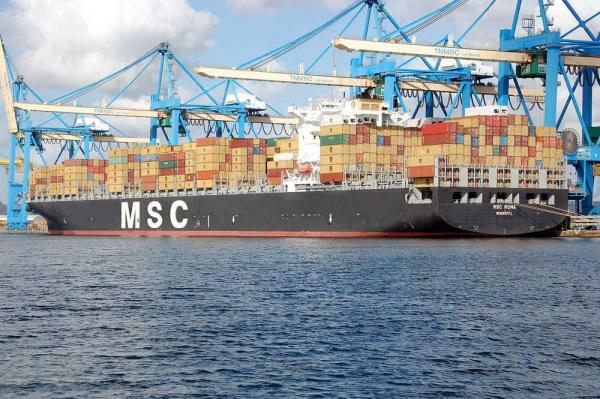 The MSC has so far bought the largest container vessel ever into the port of Savannah holding 9,200 shipping containers. We were all hoping our containers are not at the bottom. Fortunately according to sources they are not and as of Wednesday were in the process of clearing customs. The container will then be loaded onto a truck and drive through a pair of giant radiation detectors (above) designed to sniff out any nuclear threats. In the good old days (prior 9/11) the nations 4th largest port did not even have a fence around it. The marshlands around the port were considered enough of a barrier that port officials decided it did not need any additional security. Not so today radiation detectors are just one of the many levels designed to keep us safe.